Gamers: Hiew, Wolfx, Firdaus, Albert, Matthew & frens, Laurence, Seh, Zen, Sonia, Meng, Damien, Boon Khim, Dith Kok, Kareem, CK Au, Waiyan & others. Games: Cappuccino, Dark Darker Darkest, Tzolk’in Tribes & Prophecies, Suburbia Inc, Power Grid Germany, Copycat, Bremerhaven, Okiya. Today’s (13 Dec) the start of our traditional Black Friday Sale (ya, we celebrate Black Friday on different dates from the Americans LOL) and since it also coincided with a Friday, we had our usual Friday meetup tonight. Given the Friday the 13 theme, we decided this was the best time to break out DARK DARKER DARKEST, one of the recent Kickstarters from Queen Games. For more details on our Black Friday Sale which closes 12 January, pls check out BGC Black Friday Sale 2013. We started with one of the recent Essen light games CAPPUCCINO. Looks deceptingly simple yet when it gets to the table, it’s brutal. It’s dog-eat-dog to the bare level where the largest/biggest simply chomped down the weaker. Above: Wolfx stacking up his coffee cups! At the end of the game, everyone just stacks up their captured cups to see who has the longest tallest stack and he’s the winner! Alrite, time to bring out the zombies! After all, what else do you do on the evening of Friday the 13th except bash some zombies! Let’s take a look at the first play of Dark Darker Darkest @ OTK on a black friday evening. Kareem got the group started with some rules briefing… Laurence looking cheerful (of course, belum encounter zombies yet) and the board looked busy. In DARK DARKER DARKEST (DDD), you played one of five survivors. Your objective is not lame like those other zombie games which is either to save yourself by running to a helipad or just bash as many zombies as you can. Here you have a grander objective of trying to stop the zombie apocalypse which was apparently triggered by one Dr Mortimer. You can do so by infiltrating his heavily guarded house (by zombies la, what else) to find and unlock the key to his laboratory. Actually the user guide stop short here of telling us what to do next. Yes we unlock Dr Mortimer’s laboratory and then? Hey what do we do next??? Given the lack of proper instruction here… let’s just get back to the basic primal objectives – let’s whack as many zombies as we can!!! Yay!! Note: Ok, so the other zombie games objective is not so lame anyway. Tsk tsk. Dr Mortimer’s lab has a super security system (don’t they all) which requires you to decipher three sets of key locks (from the available eight tokens) and you only get one chance ie once you form a key lock using any of the three (of nine) tokens above, you can’t change the lockset so your team needs to be sure which tokens to use to form the three locks. In DARKER mode, you need to make the combination using 8 tokens. In the first two mode DARK & DARKER, your team will always be able to find the right token combination provided they search the house properly. However in DARKEST mode, there’s no guarantee you’ll be able to discover the exact matching token combination even if your team searched the house exhaustively. Yup, a game where it’s possible your team would with despair. Ah.. I’m beginning to love the game! 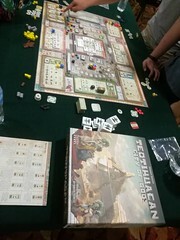 Note: Some of the game components you see here are not available in the retail version of this game since we were playing the Kickstarter Edition which included lots of stretch goal game components. Dr Mortimer’s house is built modularly using oversize tiles. That’s good. It means more replayability with this game, plus easily expanded with more building tiles. You and your four friends (read: in zombie apocalypse, “friends” are people you should sacrifice to the hordes when situation gets desperate) huddled at the start in a “safe” room, presumably the entrance to Dr Mortimer’s mansion. Jeez.. why do super rich fellas like these want to end the world? I thought it’s only the desperately poor who wants the world to end? Each of the survivor gets to pick a character/role, and they have varying abilities and starting weapons. Above is Nina Argento (think it was Boon Khim’s Kareem’s character). You get exactly five survivor boards in the Retail version and the Kickstarter added 2 more exclusive survivor boards (Chuck and Bunny). Let’s take a closer look at your survivor board. The green cubes are your action points. You get to spend a certain number of action points each round and that’s determined by your energy level, which is tracked by the two rows of round markers. You need action points to move, search, pass/receive equipments, put out fire, unlock doors or combat. Nina starts with 4 action points but as her health deteriorates, she could drop to 3 or even 2 action points. The “skull” obviously marks your end of life. Good nite! The row of 1..10 indicates your Experience (XP) points and you gain this when completing some tasks (or killing zombies!). Once you have gained sufficient experience, you can unlock the (4) skill tracks below which gives you permanent abilities. Each character comes with their own set of experienced skills – and that’s what makes the game interesting – for eg Leo a firefighter can unlock a “double axe” skill! Don’t worry if your character has no weapon… you can always fight with your bare fist (one die roll). After all, it’s immensely more satisfying when you feel your fist crunch into the zombie’s skull! The Retail version came with 5 survivors, with the Kickstarter version adding two more – Chuck and Bunny. Love the fellow with the shuriken. J The Kickstarter version also has color bases for each of the characters (to match with colored survivor dice). The Multitracker board (shown above top left) delivers an interesting teamwork/flow mechanic for this game. Each of the five squares above indicated how the survivors are grouped together – from a single team of five (using only one square) to five teams of one (ie individual) which would use all five squares. In the above example, the first team comprised yellow/orange/blue while green/purple were huddled as the 2nd team in another room. Survivors collaboratively decide which of the two teams move/act first (ie in the first box) and within the team, the survivors can choose to take their actions (spending action cubes) in any order or sequence. There’s plenty of flexibility in the action sequence and I like how they group the teams so that survivors can work to coordinate some of their actions. This Multitracker board also marks the sequence of events/flow of the game for each round. The Event track cycles thru Zombie Spawning, Fire Spreading and Darkness Grows – each event serving to advance something bad for the survivors. 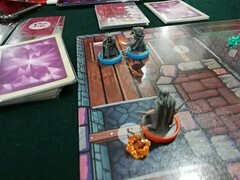 In the Zombie Spawning event, a zombie spawn token is placed facedown onto the board – the location of the room is determined by two dice throw. The number of zombies in the horde is unknown as the spawn token is placed face down (ala Space Hulk’s spawning of genestealers). So you get to know there are zombies in that room (with spawn token) but not how many are in that horde. The zombie spawn token is flipped over to reveal the number of zombies in the hordes during the zombies spawning phase of the round later on. Or when the spawn token is caught in the line-of-sight (LOS) of a survivor. This game employs the LOS technique to activate zombies or certain features of the house/room for eg the security camera. LOS is simply a direct & clear line of sight orthogonally and locked / destroyed rooms & walls obviously blocked line of sight from a survivor. You don’t know what you can’t see, right? Zombie can also be spawned by the Terror die when the zombie horde icon is shown. Searching is an important task especially in the early game stage as it helps to provide additional – and hopefully useful – equipments and tools for you and your team mates. You can pass on stuff you found to your team mates if they are in the same room – any reason why it’s useful to work in groups than to bugger off on your own solo mission (this is implemented by a terror die which tells you which nasty event is trigger if your search was too noisy). Lots of dice in this game; survivor dice (in player colors) – these for each player; one d4 & d6 die to select room – for zombie spawning, terror die (black) – to resolve terror events, and creature dice (red but above shown are the glow-in-the-dark creature dice). The Kickstarter edition gives you glow-in-the-dark Terror & Creature dice. The game also employs a “cancel” roll in the survivor’s combat dice rolls where a cancel roll would negate another die roll (possibly a hit roll) but the interesting element is that a “cancel” roll can cancel another “cancel” roll – see 3rd example above. Ah.. The fun of zombie apocalypse is the possibility of you becoming one of them hordes, no? 😛 In DDD, you can get “bitten” when you are combacting a zombie.. and once you are bitten again, the Zombification process starts. Your body starts mutating into a zombie, your human ability is decayed – which is marked by a gray cube (above) decaying your permanent skills (if you have acquire them thru Experience points) causing you to lose that permanent ability. And you can also never re-develop the lost abilities again. Ouch. This decaying process can be halted if you can find the “antidote” (as an equipment card) but the zombie virus forever remains in your body and if you are bitten again, the zombification process would resume. Once bitten, there’s no turning back…. What happens if your zombification process is completed without finding the antidote? You turned into a zombie – replace your character on the board with a zombie figure. However you can rejoin the game as a “new person” (either with the same character card or a new one if you have the 7-character pack from the Kickstarter ver) but you enter Dr Mortimer’s mansion thru the entrance (the initial starting point). Not too bad… at least it keeps you in the game. Ah.. what’s a zombie game without those big badass creatures / nemesis that takes more than one hit to kill. You won’t be short of them in DDD and in fact if your team managed to decipher the security system and unlock the laboratory, one of you – the Chosen One! – would still need to enter the lab alone to confront a Nemesis. Win that and you save the world! The Retail game comes with two Creatures – Zombie Guard & Dog – while the Kickstarter added three more (the larger ones). The CREATURE comes with their own character card, indicating their ability & skills and also how many hits it require to kill them. Not an easy task and you are advised to take on these creatures as a team. In this session, I think two creatures appeared – the Zombie Dog (above) and the Undead Bird (below). The Zombie Dog didn’t present too much of a problem for the team but they had a bit of fight with the bird before taking it out. It was 4-against-1 on the Undead Bird so I don’t think it asked too many questions of the team. There’s also another element of the game which hampers your team’s Save-the-World effort… a fire spreading thru the mansion and destroying rooms, making them unpassable. Careful not to let your team be cut-off from each other by the spreading fire. A survivor would also need to take (health) damage when entering a room in fire so that’s bad. If Fire is left unchecked and spread too quickly throughout the house, you could lose the game quickly… since 1) each destroyed room moves the Darkness Grow marker forward by one space (you can variant this to make the game more manageable) and 2) you’ll lose the equipment or lock codes in the destroyed room (this is more damanging IMO). I dun remember them telling me about FIRE in their session so I suspected Fire was either not triggered in this session or it was quelled pretty quickly. Or they forgot about it! Back to the game itself.. at a critical juncture of the game, Kareem was surrounded by hordes of them undeads (see below). Not sure how he got himself into that sticky situation but apparently if you checked to see where his “friends” were…. … you realized they were like half-way arounnd the way (at the top left corner of the room in the pic above)! I guessed they must really love Kaz… LOL. See what I told you about friends being merely zombie food when push comes to shove. Kareem thought so too.. or at least he thought even if he died, he’ll just reincarnate as a new character and rejoin the game (albeit sans all equipment and abilities he has acquired so far). Until they checked the rulebook and found out that you can only rejoin the game if you died as a result of zombification (technically you didn’t die, you just turned into a zombie) but if you were killed in a zombie fight… erm, you remain dead. Kaz: WHAT! I can’t rejoin the game??!! I thought this is an Euro game with no player elimination!!! And so ended humanity’s hope. With one survivor out of the game – and the death of a survivor also moves the Darkness Grow marker space forward (closer to the “5” marker to trigger the game end round) – the team did not have sufficient time / action to complete their mission. The version we played is the Kickstarter edition which was successfully funded on July and Queen committed to deliver the game for pickup at Essen. That’s probably the only reason why I chose to kickstart this since if the Kickstarter version was to be shipped to me, it would have incurred serious shipping charges! Queen appeared to overdo this release… giving us TWO big boxes; one to store all game components for the standard Retail version of the game, and the second to keep all Kickstarter goodies!! Wow… I think they could have put everything into the single big box! Some of the goodies from the Kickstarter include a Helipad mini-tile expansion – for those of you missing the helipad! Some said it’s a must-have in all Zombies game… hoho. The Kickstarter also came with two additional Creatures – Giant Snake and Gorilla – and featured two extra Nemesis including Dr Mortimer’s wife Helen Kronen (below). I’ve not actually properly inventorize my Kickstarter edition. Might do that one of these days and upload a snapshot of all the game components. We are preparing to pull this game in from Queen Games as soon as they confirm availability and if you quote us “DDD1312” when you book your pre-order copy with us, you’ll get a special discount on this game. Doesn’t come cheap, at estimated retail of USD90 this game looks like it’ll be retailing here in MY for RM299 (get thru our webstore for a 10% discount). If you are wondering what’ll be in the standard game, this would provide a good guide. We’ll confirm once we hear from Queen on their retail copy. Beside DARK DARKER DARKEST, the other Essen 2013 games we did tonight was the Tribes & Prophecies expansion for TZOLK’IN (which itself was last year’s Essen release). We’ve always enjoyed Tzolk’in and it was definitely one of our faves of Essen 2012. How would Tribes & Prophecies improved it? Let’s read on. Ivan did the rules for this table since all three – Dith, Allen and Hiew – have not done Tzolk’in before. 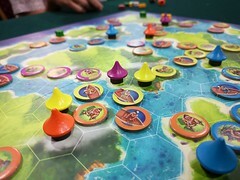 Beside the obvious TRIBES and PROPHECIES elements to the expansion, this XP for Tzolk’in also adds in a 5th player option and additional Building tiles. The main attraction however still remains the Tribes & Prophecies elements. 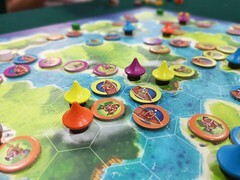 The TRIBES part of the expansion provides you with 15 tribes (above); two dealt to each player during startup and you get to choose one tribe which has special and unique ability that modifies the game for you. Now Tzolk’in won’t feel same-same for all players. For eg the Yumkaax tribe (above) has its own multiple worker placement cost (which is much cheaper than the standard cost) which might influence the player to go for a worker-heavy strategy. The second element of the expansion involves the PROPHECIES tiles. 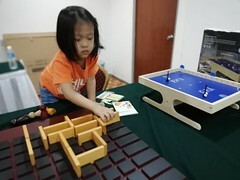 Three of them are chosen at start, placed on the Prophecy board (above) and their effect starts from the 1st feeding phase (ie 1/4 of the way into the game). Each prophecy tile has a calamity (bad) and bonus points (good) that affects everyone. While the bonus points is a one-off bonus when the prophecy is resolved, the calamity effect stays until the next feeding phase. Therefore every player needs to make their game plans around the three prophecies. They are open information so there’s really no excuse not to make sure you minimize their negative impact on you. Above: Prophecy board showing first prophecy resolved. Game was in 2nd prophecy stage. Both me & Ivan agreed the additions look like the Tribes & Prophecies should have been in the base game when Tzolk’in was released last year. Perhaps the designers were not quite ready with them and decided to hold them back and release a base game without these elements (rather than one that’s not fully tested). After having played with Tribes & Prophecies, we do find the base game Tzolk’in without these elements appear “incomplete”. While the 5th player addition is possibly not necessary, it’s interesting to have the option for orange player color (which is not the usual player color mix). The new buildings are okay… you wouldn’t miss them if they were not around but it’s good having them in the mix as well. We are also not sure (yet) if the Tribes are balanced or are there one or two with overly powerful ability (more plays would tell us this). All in, I would say if you are a Tzolk’in fan, you certainly want to get Tribes & Prophecies into your base game. Whether you’ll want to do 5-player or just stick to 4-player (which we think is the optimum player count for this game) or throw in the new buildings, consider those as bonus from the expansion. If you do, tell us what you think? We also have some new faces for tonight’s meetup so instead of all Essen new releases, we saw some of the popular classics getting play time. One of them is POWER GRID where Albert took Matthew’s group through the Germany map. Always a good game when you have 6 players. This group has done Puerto Rico before so Power Grid’s certainly a good next game for them. Friedemann seems to be getting the right attention tonight with another of his games getting play time at OTK when Seh brought out his Secret Santa gift COPYCAT. I usually don’t play DOMINION but COPYCAT is one of those games with Dominion mechanic that I enjoy playing and would gladly sit down for a game anyime. But tonight’s the first day of our Black Friday Sale and I’ll need to help attend to customer’s inquiries otherwise I would have joined Seh for this session. SUBURBIA‘s the next requested game from Sonia & Meng. This is – like Tzolk’in – last Essen release but it has an expansion out from this year’s Essen – SUBURBIA INC. The base game itself – again like Tzolk’in – is a solid Euro city building game. It’s thematic and while you need to get past the learning curve of adjusting the income & reputation markers whenever you build a new building, you get a good sense of satisfaction seeing your suburb grow… hopefully into a winning city! Zen, his suburb was one of the fastest growing during mid-game and with three border tiles, he’s playing a very tight balancing act making them fit. I didn’t get a pic of Meng’s suburb and if I remembered correctly, he took the no-border option and built his suburb without picking any border tile. Verdict? Yes the border tiles – while odd looking – do add another layer to your city growth strategy and the addition of new building tiles (to all A/B/C decks) helps keep the game fresh. Spatially challenged gamers would likely disagree with me, tsk tsk. Marketing break now. Our Black Friday Sale is on now and will last till 12th of January where almost everything in the shop is going for 30% discount, with regular daily Hot Deals (announced thru our Facebook page). For more pictures of this meetup session, pls see our Facebook photo album (below). 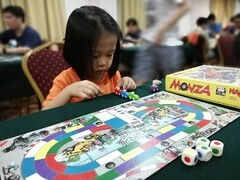 For more photos of this gaming session, visit our Facebook Album. 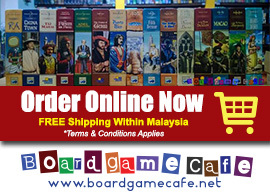 We carry over 800+ games and provide prompt and free delivery to anywhere in West Malaysia. Min order applies for free delivery. If you are a retail store looking to sell boardgames, you are most welcome to get in touch with us.